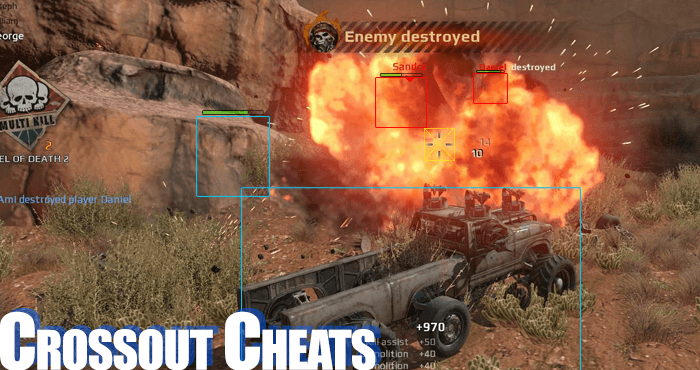 Is it possible to cheat in Crossout? Yes indeed cheating is possible in this car action shooter, as in most online games with shooter mechanics: An aimbot can be used to automatically lock onto and/or shoot a target and can even be set to target vital parts such as the engine or guns for easy kills, a wallhack or radar hack can show you the position of all anemies on your screen and on your minimap, making it easy to find them and shoot them which is useful in PvP and PvE alike. However, there are NO hacks for unlimited coins, crafting materials, reputation, vehicle parts ect. Is it legal to use hacks and aimbots and will I get banned for it? Cheating in online games, just like on offline games, is completely legal everywhere in the world. However, it is against the Terms of Service of the game, which means that your account can be banned from playing. Gaijin Entertainment has the right to ban anyone at any time from their game without having to justify themselves at all. That is the worst case and is easy to avoid by using quality cheating software developed by professionals that kept up to date at all times. 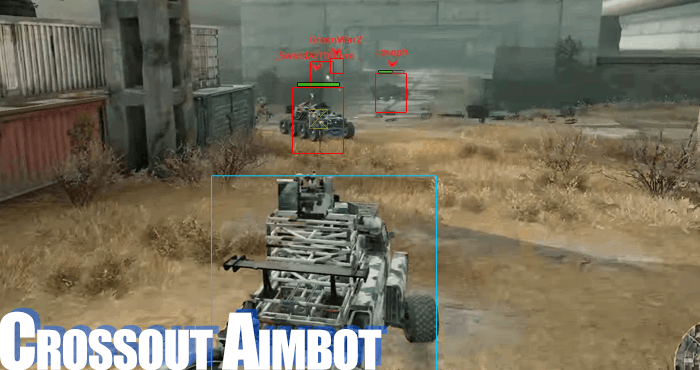 An aimbot is a program that exloits the way shooters work on our machine in order to automatically lock on to an enemy player or a pve opponent and then either shoot them or stay locked on. In order to allow for fair gameplay the whole map, including all enemies, has to be loaded ont your machine and the aimbot uses that information to extract locations of other players, important objects on their car, such as guns, the engine ect and then automatically locks on as soon as line of sight is available. Most aimbots will be able to either just lock on to a target at the press of a button, automatically shoot after locking on, use smooth aiming in order to hide suspicious movement and so on. All kinds of guns should work fine with a Crossout aimbot, but Machine guns and Auto Canons ect are more obvious, while low fire rate cannons like the 76mm cannon is less obvious, but slightly less effective on average. Overall the Crossout aimbot is without a doubt the most effective way to farm PvE raids for materials and to farm reputation score from PvP matches, max out your account and acquire rare components. However, in order to avoid bans, one must use this kind of auto aiming software with care, with respect for other players and only if the match is unbalanced. Toxic cheaters that use this kind of program to dominate other players, will get reported manually and banned, which is the way it should be. Noone like a toxic cheater. Wallhacks and radarhacks work in the same way as aimbots in that they find enemy positions and then use that information to display the enemy on your screen and on your minimap, letting you know exactly where all enemies and ally cars are. Wallhacks are generally cheaper to buy than aimbots, and a lot harder to detect manually. Exploits are bugs that come up from time to time that can allow you to farm extreme amounts of resources, reputation, materials ect. Exploits can be very powerful and allow you to duplicate items, get unlimited money, health ect, but they usually get patched within days of going public, so using private exploits is the way to go. Exploiting is also incredibly risky and should not be done on your main account. Auction House exploits are probably the most powerful cheats overall when it comes to getting coins in the game. As already mentioned it is impossible to get unlimited health, ammo, coins, crafting components or rare parts and gear in any way. 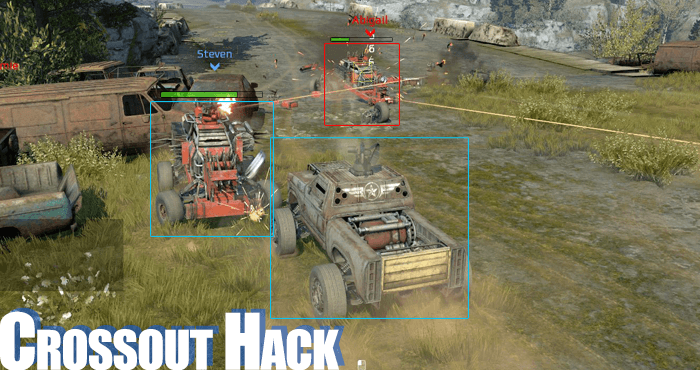 Crossout is an online game and all important player data is stored on the game servers owned by Gaijin and not on your machine, making it impossible to hack your inventory, unlocks, items, gear, builds, coins and reputation. God modes and unlimited ammo are impossible as well, since player data during matches is also processed on the game servers and not on your game client.